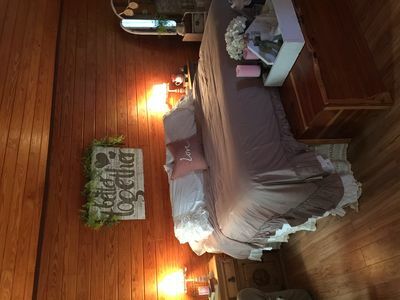 Perfect Retreat for a Girl's Getaway! A totally delightful log cabin decorated in perfect boho chic fashion and the ideal spot for a girl's getaway weekend, or a reunion of sisters or friends! Decorated with females in mind, it is colorful, yet calming, and - once there - you truly don't want to leave! There is a double bed downstairs, along with a sofa that makes into a full bed. The upstairs loft hosts two twin beds. 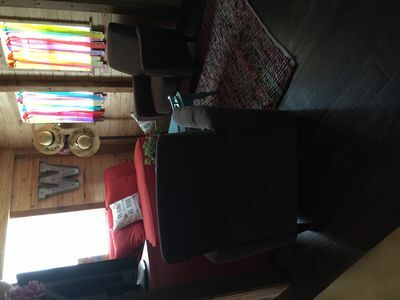 The cabin itself is full open concept - dining/living/sleeping. There are two living areas for intimate conversations, a full bath with plenty of large, soft towels, and a kitchenette with a microwave, a convection oven, and a full-size refrigerator and coffee pot. A fire pit and grill are just steps away for your convenience!